POSTED: Sat, 04/26/2014 - 05:00 | POSTED BY: Traci C.
One of the most expensive merchandise lines with ties to the film comes from the U.K.-based Crow's Nest. 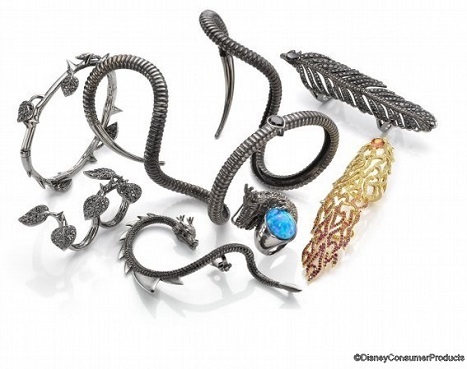 The seven-piece jewelry collection includes a cuff inspired by the shape of the evil fairy's horns, priced at $5,720. The collection also features a rose gold, full-fingered ring with yellow and red sapphires that will set you back $20,880. Disney Consumer Products has partnered with Italian scarf make Faliero Sarti to create to cashmere scarves. One is blue with a thorn border design and depicts Maleficent lurking near a cabin in the woods. The other is a black scarf and features an image of Maleficent framed by thorns, skulls, and black birds. The scarves will retail for $438 each. Stella McCartney has designed an eight-piece collection that includes an Aurora dress for your little princess ($145) and a Maleficent dress for little girls that includes fabric wings ($145). The collection also features items for boys including canvas kicks with detachable wings. The Stella McCartney collection will be available through the Disney Store and Stella McCartney stores at the end of April. Other film-inspired merchandise includes a collection of clothing items from David Lerner, a women's collection designed by Naeem Kahn that will be available on HSN beginning May 7, and a line of MAC Cosmetics that includes blood-red lipstick. The MAC merchandise will be available beginning May 15 at MAC stores and Macy's. Maleficent stars Angelina Jolie and Elle Fanning and arrives in theaters on May 30. Hot Topic has some more affordable and really cool things in their Maleficent collection. My favorite is a sort of cape piece - really cute, modern, and spooky.